Marie Kondo’s “katazuke” (tidying-up) method that encourages people to keep items that only “spark joy” – and let everything else go – has become a sensation. While her style, which combines stereotypical Japanese-y gentle moves and girly smiles with an interrogative approach that forces you to give up your assets seems to have established an enthusiastic fan base in the US, there are a certain number of people who are voicing strong disagreement. If you are curious why people react to her so vehemently on both sides, sparking not only joy but also a debate, it may help to understand the unique “Japanese-ness” she represents in the niche of decluttering. Before getting into the details, it is probably a good idea to review what the recent “let your belongings go in order to feel happier and freer” movements – either minimalist, decluttering or tidying-up – are all about. It may sound odd, but the Yerkes-Dodson law in cognitive science, which observes an empirical relationship between arousal and performance, can explain why so many people find relief in decluttering in today’s material-packed society. The Yerkes-Dodson law assumes that humans tend to perform best when they are moderately aroused: neither too bored, nor too stressed – but just right. It can be applied to pretty much any task you perform. For example, the right volume of the right kind of background music may help you concentrate on your tasks, while soft, quiet music may make you feel sleepy or blasting metal rock will distract you. A moderate amount of interaction with your co-workers should make you feel motivated, while too little communication will disengage you and too much intervention or micromanaging will irk and dispirit you. At the end of the day, we are a sensitive animal whose performance can only be maximized when the external stimulus is at the right amount/quality. Figure: The Yerkes-Dodson Law, which is symbolically expressed by a bell curve to highlight the fact that our abilities are not limitless and can only be maximized when we are properly focused. Now apply the law to your performance in managing your belongings. If your house is almost empty, things are probably 100% under control but you are bored (the left hand side of the figure). Feeling that you can take on more, you acquire a variety of items. Your place is now moderately filled, and your belongings are delivering the services/pleasure you seek (optimal level). Excited, you add more stuff. And some more. At some point, you find that you have overdone it: your place has become full of clutter, you feel disorganized and stressed, even overwhelmed because you don’t know what to do with all the things you’ve accumulated (the right hand side of the figure). Despite your belief that “more” belongings deliver “more” happiness (a linear correlation between the two), in reality the level of happiness starts to diminish as you keep increasing your inventory, because your ability to manage your belongings has a plateau. As you may have realized by now, tidying-up or decluttering is not really about giving up what you cherish: it’s all about maximizing your performance to keep your place healthy by adjusting the amount of things you need to manage. The number of belongings should be decided not based on how many you want, but how many you can comfortably take care of. According to decluttering advocates that is how you will become relaxed. Minimalists also remind us that the amount of material filling our society today is way, way more than we can manage. Just as you may become obese or diabetic if you keep ingesting the large amounts of sugar that are offered to you in processed food and drink, so your home can become inundated if you keep buying things just because they are good deals. Since people tend to realize only after it’s too late, they need to seek help from decluttering experts such as KonMari to relieve the place. Figure: As you increase the number of belongings, they eventually exceed your ability to manage them. You start feeling stressed and anxious, instead of happy. This is a very legit argument. Everyone has a different tolerance level to manage belongings, and any tidying-up method, including KonMari’s, is just training wheels that facilitate you to find it. I read that some people are pretty resentful that Kondo said only 30 books are allowed. While she denies saying that, you shouldn’t fret about the numbers because you would know the answer regardless of what Kondo said or didn’t say, if you focus on finding your own tolerance level to deal with your own stuff. Directionally correct or not, that should be the question. You can take care of your own details. While this argument is universal because it boils down to each individual’s ability to manage things, there is another possible scenario in which your personal perceived slope for an allowable amount of belongings is different from the amount KonMari advocates. This one involves a cultural gap – it is where her “Japanese-ness” comes into play. Japan is a resource and flat land-limited, small country confined by oceans, with a dense population. As a result, people were forced to learn to live only with what they had, intently listening, adopting/conforming to what nature provided/didn’t provide. 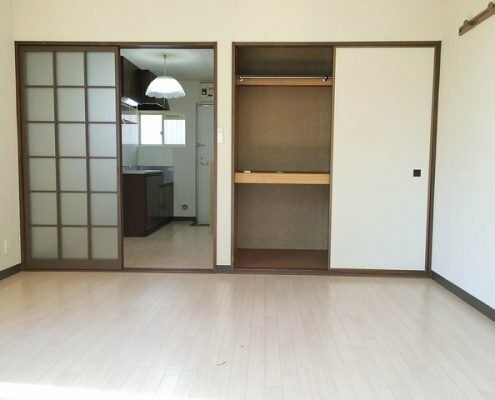 Particularly relevant to decluttering is the size of residential units in Japan, which are less than 100 m2 on average, reflecting the scarcity of the land suitable for development. 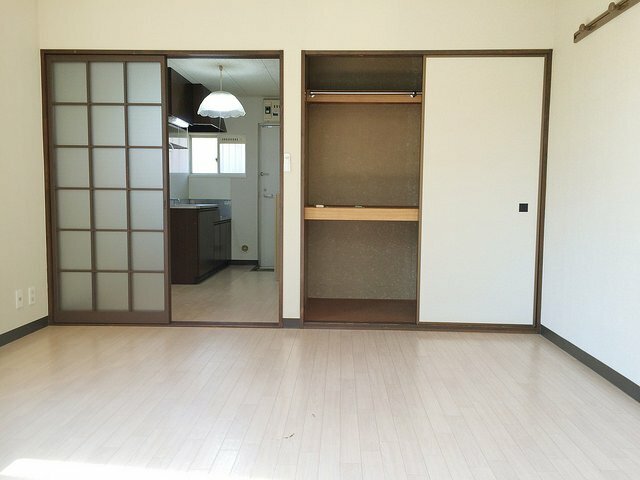 The “Tiny house” is not a trend/choice, but has been the norm in Japan. If you live in such an environment, your daily life becomes a series of “katazuke” (declutter and tidy-up) trainings – otherwise you can easily end up buried in things. And it’s not just your private space. Common/public areas have traditionally been small or limited, so people have put a lot of energy in keeping those areas clean and neat. Left: Traditional Japanese houses used the tatami mattress as a unit. 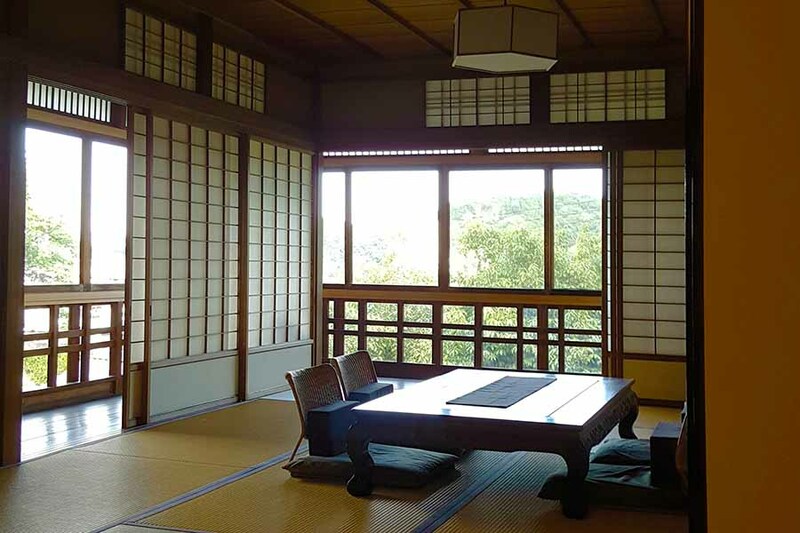 A typical room came in 4 1/2 (about 8 m2), 6 (about 11 m2) or 8 (about 15 m2) tatami, which leveraged various devices to overcome the smallness. Right: Even today, real estate is not very affordable. A typical apartment unit has a kitchen right next to the entrance door, and consists of only 2 or 3 rooms with limited storage areas. 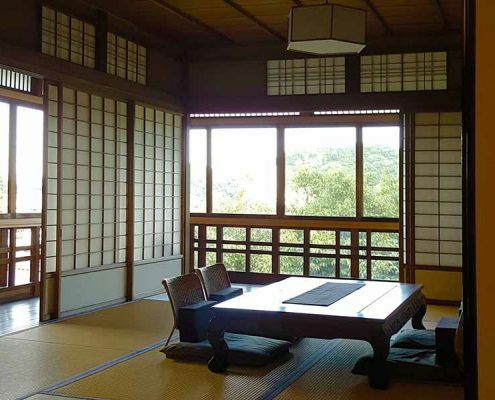 Environmental constraints are so immediate to people’s daily lives in Japan that they have often been the major limiting factor that significantly influenced how people performed different tasks: smaller living environment made people focus on keeping homes neat with fewer materials, each of which are treated with care. Smaller working spaces and limited resources required a faster/more concentrated working style in order to increase productivity. It is not a coincidence that Japan is dubbed one of the cleanest countries and most efficient/productive economies, because those characteristics were shaped by the same environmental constraints. It helps you to do with less, instead of more, in order to stay focused, neat and productive. Slide 1: You have your own optimal performance level to manage belonging. Slide 2: However, environmental constraints in Japan trained its people to maintain lower quantities of materials to keep places neat. Well, thanks for an interesting perspective, BUT no thank you, say the anti-KonMari. Why do we have to endure the same restrictions in America, when we have bigger platforms for everything, including living/storage spaces? In addition, we have technology to solve many constraints today. Even when it makes sense to keep only those clothes that spark joy, why on earth does she directs us to fold clothes so very neatly (she has her own folding methods for each item from shirts to underwear)? This is a complete waste of time and energy for only marginal space savings. Valid point. Her method may sometimes sound illogical, inefficient or focused too much on behavioral details. And probably there is the cryptic side of the KonMari method, or Marie Kondo herself that you may be struggling to make sense of. That aspect needs deeper digging, because it has to do with the unique role/power that the act of cleaning and decluttering has played in traditional Japanese culture. What happens when environmental conditions such as local topology, climate, resource availability or vulnerability to disasters are imminent threats to your daily life but you don’t have science or technology to overcome them? It was the common predicament all pre-modern societies faced. In Japan in the Middle Ages, people tried to mitigate bad/ominous events – deaths, diseases, fires, droughts or disasters – by appeasing nature. They did so through various protocols or rituals, some of which included cleaning. But why cleaning? It’s because ancient people believed that bad events were caused by nature that was angered by human misbehaviors. So they performed a formalized cleaning called “kiyome” in order to correct negative interventions by removing various kinds of “contamination” (both physical and physiological) left by people. They believed that making the place pure and pristine again, devoid of any traces of inappropriate human activities, would restore natural order and shoo away omens. Even today, Japanese use cleaning as a “kiyome” ritual/protocol for mental purification. The Ise Jingu, the most prestigious Shinto shrine, is re-built every 20 years (for the last 1,300 years) in order to keep its purity as an eternal sanctuary. Year end is a season for a big cleaning. People try to get rid of the bad/negative karma that has piled up during the year, so that the New Year can be a fresh start. Or, people sprinkle salt after a funeral as a metaphysical cleaning so that they are parted from the world of death (contamination). You also clean your entrance/porch neatly with water to welcome guests. There are many occasions in which cleaning is used as a device to transport people from impurity to purity. Left: The ceremonies of the Ise Jingu rebuilding. Right: Entrance cleaning and “uchimizu” (watering) at a traditional Japanese hotel for hospitality. As creatures capable of creating their own world that is semi-detached from nature, humans are inherently torn between a desire to shield themselves from the threats posed by the wild side of nature, and yearnings to remain open to its beautiful side and blessings. And as purity and impurity look to constantly change their positions between the natural and the human world as various events occurred, baffled ancient people resorted to cleaning to balance them: should we clean in order to block/repel unwanted dirty/ominous things coming from the dark outside world? Or should we “purify” ourselves and our sphere of influence, so that we can restore the pristine state that would be embraced and celebrated by nature? How do we strike the right balance between the two options so that we can live in peace and harmony? …But that’s hundreds of years ago, you might say. We no longer need formalistic protocols to strike the right balance because technology can solve most of the threats posed by nature. We just need methods that are practical and efficient so that our private, closed, and protected spaces can be devoid of anything dirty or raw, and are ruled by hygienic human order. The KonMari method probably also assumes the same, but interestingly enough, the old philosophy – the very Japanese approach to leverage cleaning to purify ourselves to find the right balance with the surroundings – surfaces here and there in her style. These are probably the mysterious factors that are giving Kondo a unique, peculiar catharsis – whether you like it or not. Her method starts from having her customers step back and re-imagine how they want their place to be like when tidying-up exercise is complete. She invites her customers sit down in “正座 (seiza)” position (she had Stephen Colbert do so in the video below. It was hilarious. ), close their eyes and ponder what their ideal dream place would look like. It almost looks like meditation. Meditation (Zen meditation, more specifically) tells you to have your legs loosely crossed and both feet resting below the opposite thigh or knee. This position is supposed make you comfortable enough so that you can endure the long-term practice to slowly vacate your body and mind to achieve “empty/neutral” status. On the other hand, seiza requires you to first be kneeling on the floor, and folding one’s legs underneath one’s thighs, while resting the buttocks on the heels. It is an uncomfortable position that forces you to keep your back very straight in order to alleviate the pain in the feet (Stephen Colbert looked pretty uneasy in seiza). Although they may look alike, seiza is not for meditation at all. It is instead used to keep you keenly focused on a specific target, for a much shorter duration. It’s often an action to confirm your own goal, commitment or determination when you start something important. You can also use seiza to increase your concentration level quickly and wipe away distracting thoughts. The tea ceremony, beginning or ending of martial arts training, or religious rituals are some of the occasions you are required to do seiza. It’s interesting to see that KonMari wants you to start the tidying-up “ritual” from seiza, which is meant to let you keenly focus on your inner self, not on the external elements (or your belongings/clutter) which should be the entire focus of the exercise. If cleaning was about the pursuit for purity and removing impurity, and if “impurity” meant not just biological/spiritual contamination, but rather a broader imbalance/disequilibrium that affected peaceful and harmonious relationships with the surrounding – as ancient Japanese believed – decluttering could be an act of restoring the right balance between you and your belongings. You can gauge such a balance only by looking at yourself very carefully. I don’t know how she ended up including seiza sitting in her practice, but it looks to be an effective “initiation” tool to start a “life-changing magic” (according to Kondo) of tidying-up which would re-define your relationship with what surround you. By the way, if you want to try seiza, I’d warn you that it will feel very awkward and uncomfortable at first. Do not focus on pain; instead listen to your body carefully, and try to find the right position for each part of your body so that the entire body feels balanced. Especially focus on straightening your back. Once your back is on a balanced foundation, you will feel so aware and concentrated, determined to move forward towards your goal. In the video above, Kondo also tells Stephen Colbert to touch and feel each item to determine if it’s something he needs to keep or “spark joy.” This may sound like a childish act, so you may feel silly doing it. But according to Kondo, you won’t be able to determine whether or not your belongings “spark joy,” unless you touch them. My interpretation of what she means is that, if you use only your brain for a decision making, you may end up simply analyzing the general value of each item, which could actually compromise your goal to select nothing but the objects that you love. Use your senses, not logic/information such as functionality, price tag or trend, because it’s the best way to find things that “resonate” with you without being distracted. As mentioned earlier, “fold-your-clothes-neatly” part of the KonMari method seems to be sparking a debate. If it’s difficult to wrap your head around why folding clothes is such a big deal when it looks so inefficient, but it’s long been part of Japanese traditional culture. Take the kimono. The kimono is very environmentally efficient clothing because it’s designed to last as long as possible in great condition. Folding plays an important role to maintain it in good shape, so there are protocols for correct kimono folding. You could think of it as reverse engineering: How do I want my kimono to look when I wear it next time? It has to be wrinkle-free, stain-free, and maintain original lines/shapes. You have the ideal goal in your mind, and start folding your kimono in order to achieve it. Now apply the same mindset to your clothes. You would definitely want your clothes to be wrinkle-free when you wear them next time. So you fold them by straightening the fabric as many times as possible. You may also want to fold them in line with the way the fabrics were originally cut and sewn in order to maintain the original silhouette. Folding clothes is nothing more than relating with them. Although it may require some practice (most people get impatient when they try it for the first time), it may be the easiest way to remind your body how you relate to objects. You may be surprised how it great feels when your body finds something that completely resonates with it. KonMari also asks you to say “thank you” to your belongings. This too feels like a childish ritual, but what if you remember that they are made of natural blessings in some fashion, no matter how artificial they look like? In ancient Japan, people believed that objects would come to have some sort of spirit or soul as they were used. They especially treated tools used to directly alter natural states such as knives, scissors or needles, with care. (Altering nature could disrupt the equilibrium, therefore that’s where purity/impurity would collide) Tools were often sent off with a religious ceremony when they ended their lives. A funeral for tools so that people could say “thank you” for nature for letting humans alter part of it, and for the tools for facilitating the work. Using tools meant interacting with nature, and people appreciated the history of such interactions. Monuments to celebrate end-of-life cooking knives and combs at Japanese temples. Today we perceive products/items as soulless, and it’s an effective way to manage many of them – it’s emotionally intense and a lot of work to take care of anyone with heart. But the downside of such an approach is that you could end up surrounding yourself with items that are valuable but not relatable to you. The raison d’être of products are not to exist as a product. They are there to help you interact with your surroundings one way or the other. When you appreciate such interactions, you should also appreciate the products that helped them. Maybe not necessarily their physical existence, but the rewarding relationships they brought to you. 5) Why doesn’t she speak English? This is not very relevant to the subject, but KonMari is resistant to speak English and some people don’t like it: if you want to be accepted by American society, speak English. It’s a valid point, especially in the highly globalized 21st century. But I can’t also deny the effect of shielding the “truth” under a cryptic language in her specific case. As you may have noticed by now, the underlying message in the KonMari method is that you have to find the right relationship between you and your surroundings using your body and senses. It’s a little bit like Zen, which denies texts (although Buddhism has tens of thousands of textbooks) because it believes that eternal truth can only be accessed through physical/mental training/awakening, not from reading theories. If you ended up learning every detail of KonMari method in your own language, you may feel less need to leverage your senses or intuition. As a Zen practitioner feared, over reliance on logic can make you forget about your true, fundamental goal. When you see KonMari speaking in Japanese and you feel frustrated because you don’t understand what she is saying (although I feel her interpreter is doing a great job), I think it’s okay to try to interpret her riddles on your own. Luckily she moves her hands/body in a very Japanese way which suggests how Japanese people traditionally tried to relate to the surrounding environment. Since it is the foundation of her tidying-up philosophy, I believe it’s possible to get the gist of KonMari without understanding everything what she says. It’s even conceivable that you can internalize her style better if you didn’t rely on logical information, but on the sensorial impression you received through your body. That’s all for now. At least we can all agree that cleaning/tidying-up can get pretty philosophical!